If the homespun quality of Robin Burnside’s The Homesteader’s Kitchen (Gibbs Smith) seems a little disingenuous, there’s a reason for that; and we’re all the richer for it. This book is the fruit of my personal and professional journey preparing nutritious and delicious food for myself, my family, and my community -- a passion that began in my teens and evolved in a forty-year culinary career. 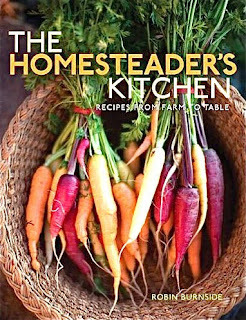 The Homesteader’s Kitchen is filled with recipes and lore about fresh and contemporary food as perfected by Burnside and her contemporaries in California over the last three decades. Influences are international and varied, flavors strong and rich. The recipes reach into all aspects of kitchen preparation, but there is a strong, if unstated, vegetarian component to the book and the section that deals with meat and fish is both small and very good.